Click on thumbnails in this article to pop-up larger images. 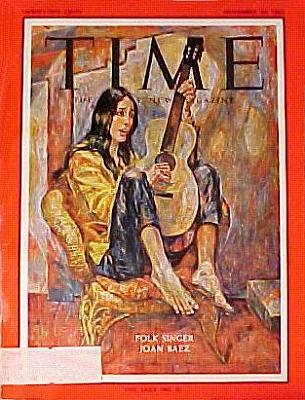 According to excerpts from the artist’s 1962 diary, Russell Hoban’s portrait of the folk singer and 1960s icon Joan Baez took 16 days from commission date to completion and delivery, and he spent around 10 of those days working on the portrait, with at least one all-nighter required to finish the job. Baez, sadly, was unimpressed. 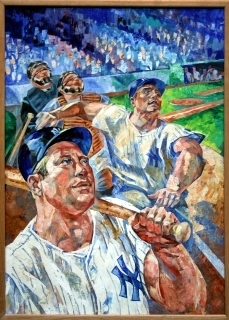 David Hajdu, in his book Positively Fourth Street (in which the painting isn’t reproduced), describes it as “an eerie Goya-style oil that could have been a thought projection of Joan’s distorted self-image … she is repellant – a skeletal ghoul clinging to a guitar…” Apparently Baez thought she looked “dreadful”, but the portrait perfectly captures the spirit of the times, and she doesn’t need the caption to be instantly recognised. [Baez] was performing in Tucson, Arizona at the time so I flew to the nearest airport … She was with her current boyfriend who was not famous and whose name I don’t remember, and she was driving a sports car which she called her ‘little grey bomb’. I watched her at the Tucson venue and made sketches, then I followed her to Carmel, California where I did more sketching and observing. We had some kind of altercation, I seem to remember, after she had pissed me off about something. 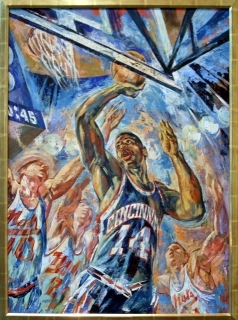 The painting was in an exhibition at the Smithsonian Institution in Washington D.C. last year. 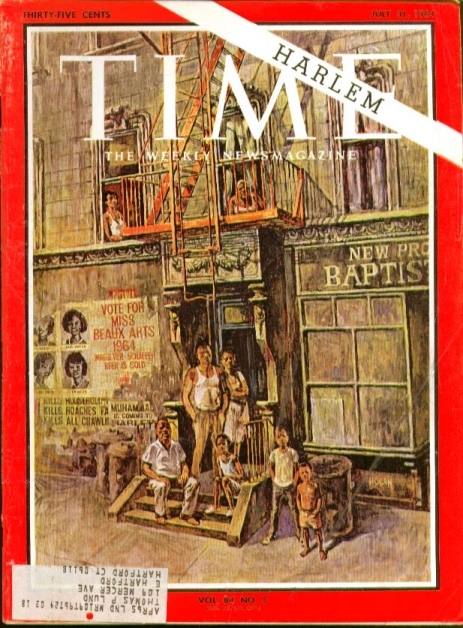 It’s owned by Time Inc. but I have the magazine cover which I keep meaning to send to Dave for The Head of Orpheus but I haven’t done it yet. The painting was done in my studio from my sketches and some photos Time sent me. Goya it ain’t. 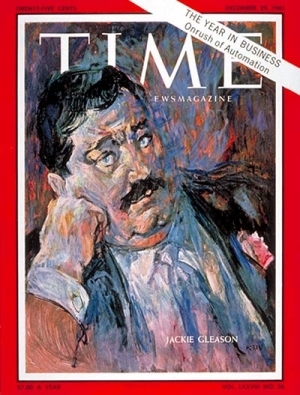 I also did a portrait of Jackie Gleason [pictured] which he didn’t like, a portrait of Maurice Richard of the Montreal Canadiens which was sent to me recently by a woman whose husband is a Sports Illustrated fan. She gave him an S.I. cover for every year since 1960 which is when they got married. 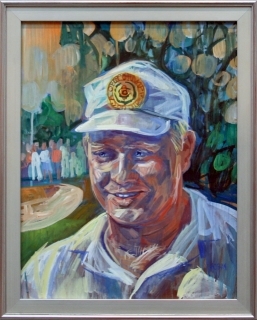 Also did portraits of Jack Nicklaus and a double one of Roger Maris and Mickey Mantle [see small reproduction below]. These weren’t used as the cover stories changed. 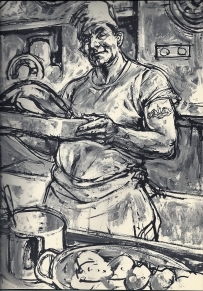 For a time (he wrote in a February 2004 message on The Kraken, the Yahoo fan group devoted to his work), Hoban worked as an instructor on the Famous Artists’ School of Westport, Connecticut’s correspondence course, “where I used to do a tutorial sketch painting and a dictated letter”. The institution was founded by Harold von Schmidt with Bob Fawcett, Al Dorne and several others. “The school made a profit because of the correspondence-school phenomenon, that many people pay for complete courses they don’t finish,” Hoban wrote in the same message. 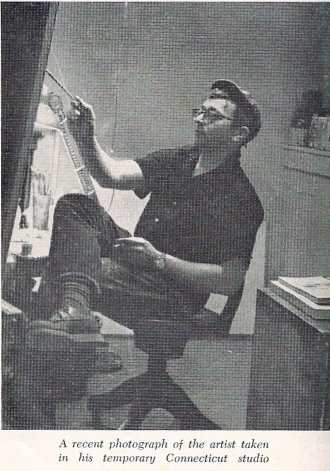 In the October 1961 issue of the magazine American Artist, designer, painter and author Frederic Whitaker interviewed Hoban for a feature article. Whitaker had an unusual, prolix writing style and something of an axe to grind about the emerging generation of younger artists (in which Hoban fortunately wasn’t included – he was already 36 by the time of that article). He does, however, provide some early biographical information that isn’t widely published elsewhere; for example, the fact that Hoban worked “exclusively in casein”, popular until the advent of acrylic colours, due to his allergy to turpentine. Hoban has the analytical ability and the tenacity of a veteran mail order executive. I wanted no part of an educational package. I was sure I could learn by reading and observation all the schools could teach me, and also a good deal more of my own choosing. From the age of five he drew incessantly from everything in sight. He even sketched at the movies. He was particularly fond of horses and drew them from life at every opportunity. During his teens he studied horse anatomy and spent long periods in a stable studying all manner of details, even such unusual subjects as the bolts, springs, steps, and other parts of carriages as viewed from the floor. 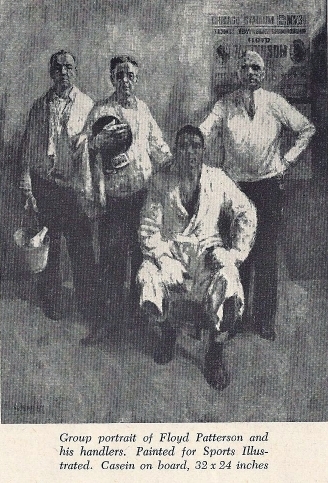 He assumed that in New York every artist paints the Fulton Fish Market, Washington Market and Stillman’s Gym (the training quarters for pugilists made famous by George Bellows), and he tried all three. 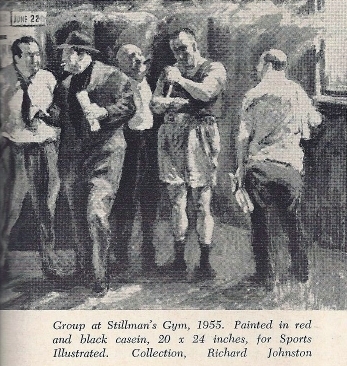 But soon his luncheon hours were all spent at Stillman’s madly sketching his new boxing friends. He became particularly interested in and made a study of the necessarily varied natures of the fighters, the managers, and the trainers, who are usually superannuated pugilists. One of Whitaker’s most fascinating insights is that Hoban himself once trained, non-professionally, as a boxer but dropped the sport due to poor eyesight. With sweeping color and sharp-edged reality Russell Hoban’s illustrations are a brilliant and passionate mirror for Poe’s strange world of fact and fantasy. Most of them were reproduced in colour in the Macmillan edition, but Elisa Bowman and I converted two to black and white for 80!, the Kraken book published by Bloomsbury to commemorate Russ’s 80th birthday in 2005. 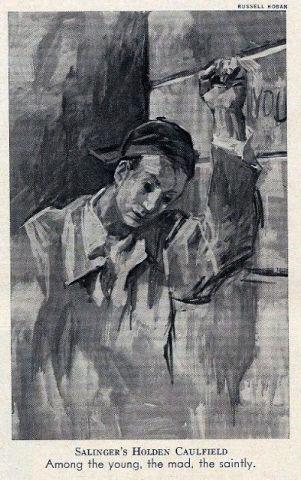 The Tell-Tale Heart illustration was on page 241. 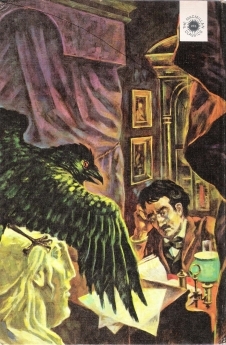 The Raven illustration was reproduced only on the book’s cover and dust jacket. 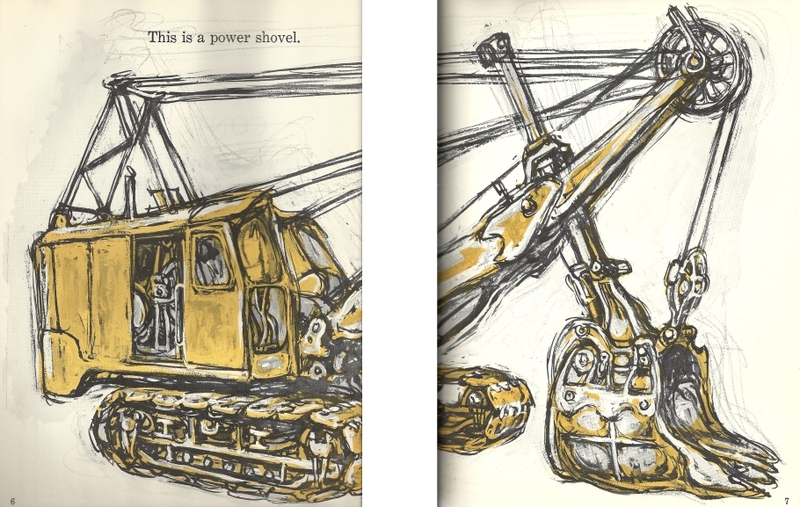 …some girt bit rottin iron thing some kind of machine it wer you cudnt tel what it wer. 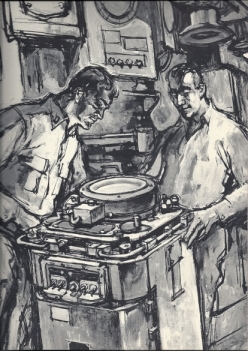 The Atomic Submarine – A Practice Combat Patrol Under The Sea (published in 1960 by Harper and Brothers) has 14 illustrations in black, white and greys – two copied from a diagram and a photograph – and nine illustrations showing the crew. 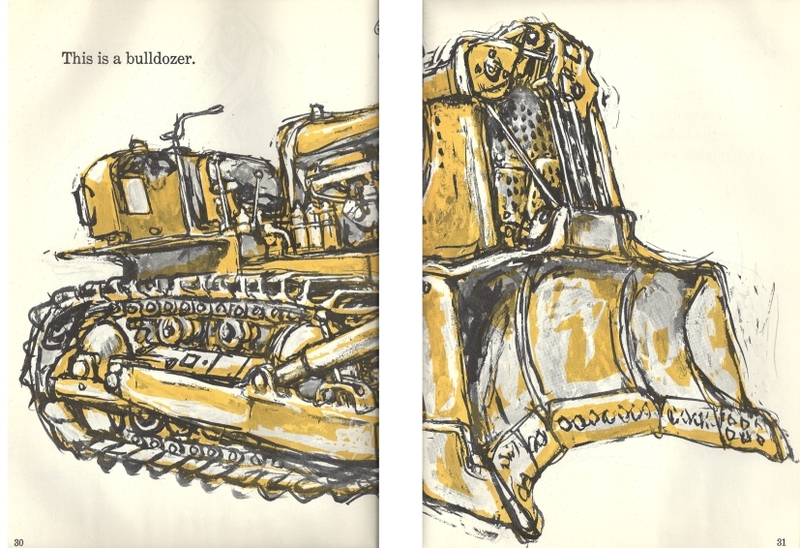 Written in a compellingly rhythmic prose and illustrated by the author in bold pictures reminiscent of Roualt’s paintings, this book dramatizes for the younger reader the force of the heavy machine and explains its function and mechanism. 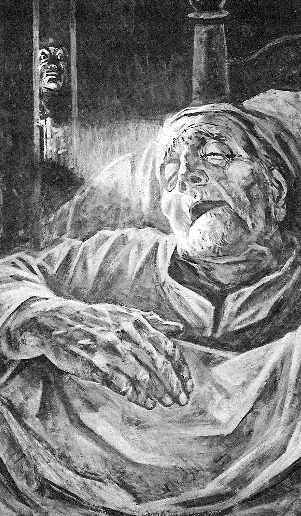 Art continues to have an important place in Russell Hoban’s novels; in fact, you might say other artists’ paintings are among his characters. So it’s even more intriguing to wonder how his writing might have been enhanced and our perceptions of his books altered if he’d continued to make his illustrations public as Mervyn Peake did. As it is we have at least two careers to consider. Thanks are due to Yvonne Studer for providing a copy of Frederic Whitaker’s article about Hoban in American Artist magazine; to Ben Hennessey for supplying the scans from What Does It Do And How Does It Work? 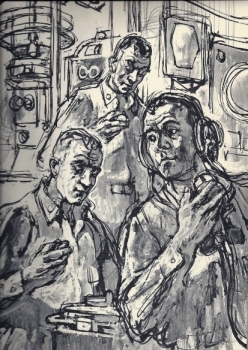 and The Atomic Submarine; to Olaf Schneider, who found the Time Harlem cover in a chance search on eBay; as well as to the other members of The Kraken who have shared Hoban’s illustrations over the years. If you have copies of any other Hoban illustrations, feel free to leave a comment below or to get in touch – maybe there’ll be a Part Two one day. This article was updated on 3 and 6 May 2014 by the webmaster to add links to Sports Illustrated images and articles, and on 28 June 2014 to update those links after SI broke them. Originally published on wordsSHIFTminds 29 July 2011. Published on russellhoban.org with permission of the author.